Jared Flood is a New York based knitwear designer and photographer. A Pacific Northwest native, Jared holds an MFA from the New York Academy of Art and travels the country teaching traditional handknitting technique and garment construction. He has been living and working in Brooklyn since 2005. His design work and writings have been featured in Interweave Knits, Vogue Knitting, Knit.1 Magazines, and Spin Off (Interweave Press) as well as various other book and online sources. Vogue Knitting describes Flood's work as "modern knitwear with a traditional vocabulary... and great attention to detail"; he has also been described as an "Inspirational Pioneer" by The Knitter Magazine (UK). 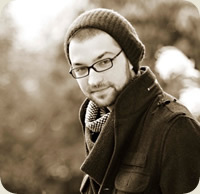 Jared’s photography has been featured in Good Housekeeping, New York Magazine, NY Spaces, NY Living, Vogue Knitting, Knit.1, The Knitter [UK], Debbie Bliss Magazine, and numerous online and book publications. He is the creator of www.brooklyntweed.net and author of Made in Brooklyn - a collection of original handknitting designs with natural fibers, distributed by Classic Elite Yarns. Jared's work has been featured in articles for Vogue Knitting, The New York Observer, The Knitter (UK), Knitting Magazine (UK), Ready Made Magazine, and Yarn Market News. My own book: Made in Brooklyn, printed with Classic Elite Yarns in 2009. Other contributions include designs or articles in Interweave Knits, Vogue Knitting, Spin Off, and Knit.1 Magazines, various book contributions (both as a designer and photographer) and original designs regularly published through Brooklyn Tweed. Jared holds a BA in Photography and 2D Media from the University of Puget Sound (Tacoma, WA), & a Masters in Fine Arts (MFA) with concentration in Photography and 2D Media/Design from The New York Academy of Art.